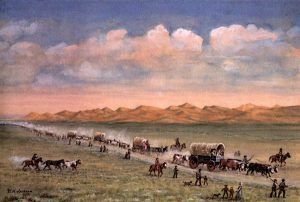 Though 19th-century settlers, as well as much of written history, looks at the 2,000-mile Oregon Trail as romantic, almost one in ten who embarked on the trail didn’t survive. In fact, the Oregon Trail is this nation’s longest graveyard. Of the estimated 350,000 who started the journey, the trail claimed as many as 30,000 victims or an average of 10-15 deaths per mile. 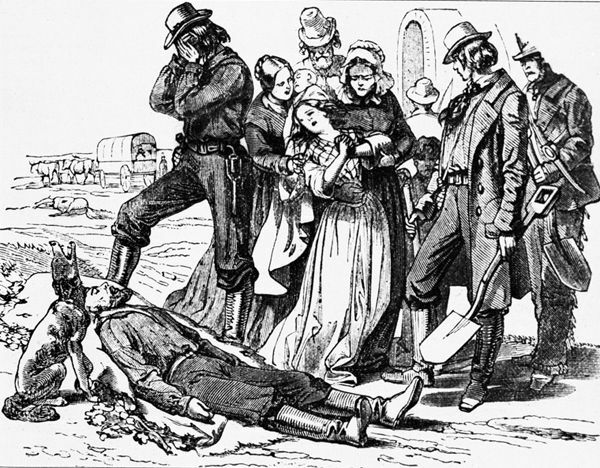 The main causes of deaths along the Oregon/California Trail during 1841 to 1869 were disease, accidents, and weather. 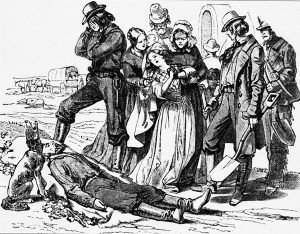 The number one killer on the Oregon Trail, by a wide margin, was disease and serious illnesses, which caused the deaths of nine out of ten pioneers who contracted them. The hardships of weather, limited diet, and exhaustion made travelers very vulnerable to infectious diseases such as cholera, flu, dysentery, measles, mumps, tuberculosis, and typhoid fever which could spread quickly through an entire wagon camp. Opportunities for sanitation — bathing and laundering — were severely limited, and safe drinking water frequently was not available in sufficient quantities. Human and animal waste, garbage, and animal carcasses were often in close proximity to available water supplies. As a result, cholera, spread by contaminated water, was responsible for the most deaths overall on the Oregon Trail. Cholera could attack a perfectly healthy person after breakfast and he would be in his grave by noon. With no cure or treatment for the disease, the infected emigrant usually died within 24 hours or less. However, many would linger in misery for weeks in the bouncy wagons. In a bad year, some wagon trains lost two-thirds of their people to the deadly disease. Food poisoning was was often a problem with contaminated food, more likely among single men. Scurvy, caused by a lack of vitamin C was also a problem. Poisoning from drinking water that was too alkaline was also common. There was a high incidence of childbirth on the trail and tragedy often came with the arrival of a baby. Death during childbirth was common and infant mortality was high. Poor nutrition, lack of medical care and poor sanitation caused many of these deaths. 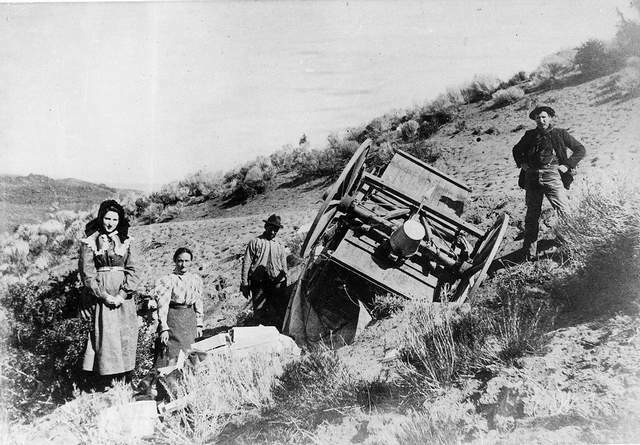 Throughout the trail’s existence, numerous accidents were caused by negligence, exhaustion, guns, and animals. Wagon accidents were the most common, with both children and adults sometimes falling off or under wagons and being crushed under the wheels. 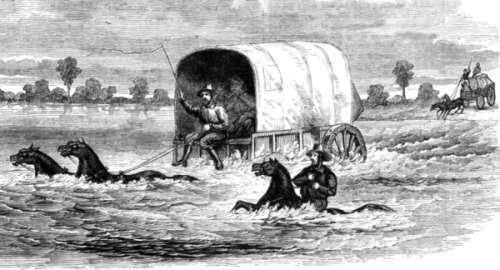 Crossing rivers was one of the most dangerous things that pioneers were required to do. 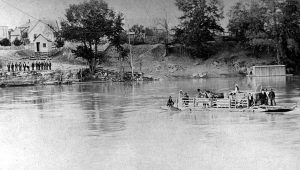 Swollen rivers could tip over a wagon and drown both people and oxen and valuable supplies, goods, and equipment could be lost. Sometimes this was caused by animals panicking when wading through deep, swift water. Hundreds drowned trying to cross the Kansas, North Platte and Columbia Rivers–among others. In 1850 alone, 37 people drowned trying to cross one particularly difficult Green River. Those who didn’t drown were usually fleeced by a ferryman. The charge ranged up to 16 dollars; almost the price of an oxen. One ferry earned $65,000 in just one summer. The emigrants complained bitterly. Over time, this risk would be reduced as bridges and ferries became available. Even then, there were stories of rafts pitching over and improvised bridges collapsing throwing people to their deaths. Sometimes, alcohol played a part. On one occasion, on June 2, 1853, an inebriated emigrant, misjudged the rain-swollen Buffalo Creek, drove his wagon in, and was never seen again.